When it comes to heart disease, an abdominal ultrasound is used as a diagnostic tool for screening “AAA”, or an abdominal aortic aneurysm. The aorta is the main blood vessel that supplies blood to our abdomen, pelvis, and legs. 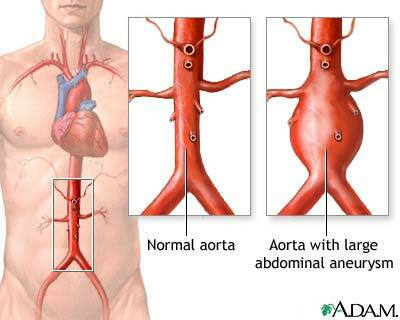 An abdominal aortic aneurysm occurs when part of the aorta becomes very large or bulges out. Photo courtesy of A.D.A.M., Inc. which is accredited by URAC, also known as the American Accreditation HealthCare Commission (https://www.urac.org/). URAC’s accreditation program is an independent audit to verify that A.D.A.M. follows rigorous standards of quality and accountability. A.D.A.M. is among the first to achieve this important distinction for online health information and services. Aneurysms can progress slowly over a long period of time, often without symptoms. Symptoms may come on suddenly if the aneurysm expands rapidly, splits open or seeps blood within the wall of the aorta (aortic dissection). The rupture of an abdominal aortic aneurysm is a serious medical emergency. Call 911 and seek immediate medical attention if you have extreme pain in your abdomen or back that does not go away. Dr. Fenster may want to schedule regular follow-up appointments to re-check the AAA. Surgery is usually done if the aneurysm is more than 2 inches (5.5 cm) across or growing rapidly. The objective is to do surgery before complications develop. A specially trained technician (sonographer) will perform your abdominal ultrasound. A small amount of warm gel is applied to your abdomen and the technician will press an instrument called a transducer over your skin, moving from area to area in order to view the aorta from all angles. These images will be viewed on the computer screen so the technician can monitor blood flow through your aorta and check for an aneurysm. No treatment, just follow up. In the case that your aneurysm is smaller than 2 inches in diameter, we may ask to recheck your condition regularly for changes, using additional ultrasound exams or other imaging tests. Open repair. In the case that your aneurysm requires surgery, one option is to have an open aneurysm repair. A board-certified cardiac surgeon would be recommended for this procedure. Endovascular surgery. Another option is to have a surgeon perform an endovascular stent graft. This reinforces the weakened portion of the abdominal aorta by threading a graft through a catheter. The graft helps to support the weakened portion of your aorta so that it won’t rupture. Where will the abdominal ultrasound be performed? Will Endovascular Repair Replace Open Surgery for Abdominal Aortic Aneurysm Repair? Outcomes of endovascular abdominal aortic aneurysm repair in high-risk patients.